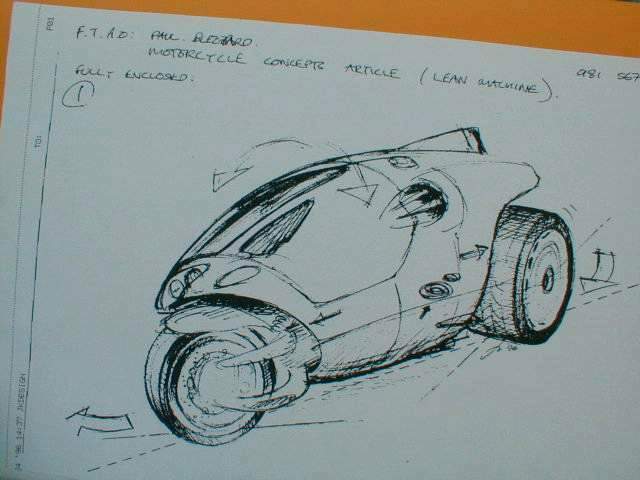 This sketch by designer John Keogh is reminiscent of the original BMW C1 TTW (Tilting Three Wheeler). It also uses the same leaning front wheel, upright pair of rears as the lightweight Honda Canopy 50 and the 600kg Carver. Great Minds Think Alike ! Submitted by DEVILHUNTER on 17-Dec-05 3:04am. Nice concept art, this Concept is very similar to mine, I have been searching the internet for soemone who has done something close to this, I found 3 so far including this one. I built a 1/10 scale prototype of my version FF fully enclosed bike which I call Spec V the "V" stands for Volt, Yes its Electric. I will post a Pic of the Spec V real soon. Submitted by loslobros on 23-Dec-06 1:30pm. Look a little closer at the sketch and you will see that it is actually a 2-wheeler: the rear wheel is extremely wide, front and rear wheels have a 'square' section, and both appear to be upright, even with the body leaning over. Perhaps the entire chassis is meant to be non-leaning, with the superstructure of the body rotating around it?